UCF may not be holding down their spot as the No. 1 team in the Deadspin 25 as they did in with their beautifully imperfect 2015 campaign, but Shaquem Griffin, the Knights’ Guy to Know, is having himself one hell of a year. Griffin, who is joined on defense by his twin brother, starting cornerback Shaquill, did not see the playing field often in his first three years in Orlando. The St. Petersburg, Fla. native was largely relegated to the role of a reserve safety and special teams player; entering his redshirt junior season, Shaquem had accrued just 29 career tackles, according to Sports Reference. Meanwhile, Shaquill worked his way onto the field as a sophomore, earning a starting role for the 0-11 Knights in 2015. Still, of the two, Shaquem commanded the majority of the attention from the media, earning several features from local and national outlets despite having a small role on one of the nation’s worst teams. Griffin commanded the attention; he received over 20 Division I offers as a high school senior while maintaining a notable disability for a football player—at the age of four, his entire left hand was amputated due to amniotic band syndrome. For the first three years, it seemed like the two brothers would fit into a straightforward narrative: Shaquill would be the better player, Shaquem would continue to earn his scholarship, and together, they would continue to be an inseparable duo. But now, instead of being a feel-good story about a hard-working player with a unique physical feature, it’s what Shaquem is doing on the field—consistently terrorizing AAC offenses—that’s getting his name published. After beefing up and making the switch to linebacker this offseason, the one-handed Griffin brother has assumed the role of standout defender for the Knights. Shaquem has been consistently solid as a first-time starter—he’s second on the team with 58 tackles, leads the AAC with 8.5 sacks, and, most recently, was named AAC Defensive Player of The Week. This, from a guy whose previous highest collegiate honor was being Defensive Scout Team Player of the Week in 2014. In this weekend’s 31-24 loss to Houston—previously believed to be the Group of Five’s best shot at crashing the playoff before its recent implosion—Griffin played about as well as any defender in the nation. 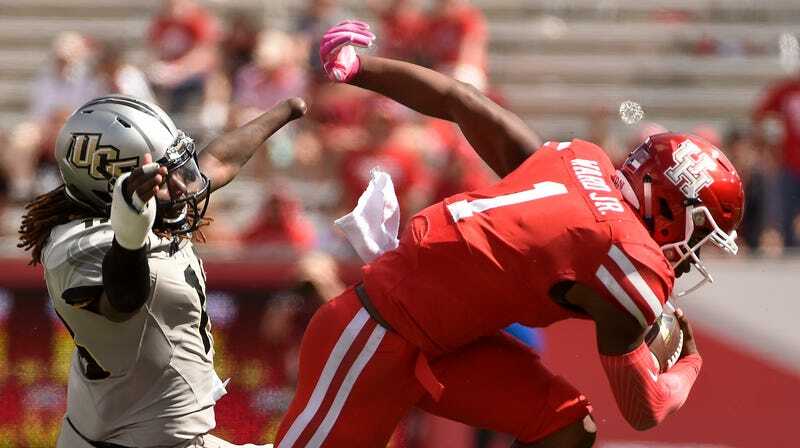 The 6-foot-1 linebacker sacked elusive Cougars quarterback and preseason Heisman hopeful Greg Ward Jr. 2.5 times, recorded a team-leading 14 tackles, had three tackles for a loss, recovered a fumble, and snagged his first career interception. After the game, Shaquem met with Julianna Linton, a Houston native who received a prosthetic arm in March from Limbitless Solutions, a non-profit run by UCF students and graduates. Linton, who was also diagnosed with amniotic band syndrome at a young age, joined the UCF cheerleading squad on the sidelines during the game. Linton’s parents said Griffin became her favorite player in the lead-up to her UCF cheerleading stint after seeing his feature on College Gameday last weekend—you can watch a full feature on her journey via UCF here.